Verity’s all about protecting her city, but right now that’s mostly running surveillance and handling the less exciting cases for the Weyrd Council after all, it’s hard to chase the bad guys through the streets of Brisbane when you’re really, really pregnant. An insurance investigation sounds pretty harmless, even if it is for ‘Unusual Happenstance’. That’s not usually a clause Normals use — it covers all-purpose hauntings, angry genii loci, ectoplasmic home invasion, demonic possession, that sort of thing — but Susan Beckett’s claimed three times in three months. Her house keeps getting inundated with mud, but she’s still insisting she doesn’t need or want help . . . until the dry-land drownings begin. As I’ve mentioned before, I love a good urban fantasy and Angela Slatter’s Verity Fassbinder series is turning out to be one of my favourites. Corpselight does some unusual things with the genre. For a start, it’s refreshing to see a pregnant protagonist. And I don’t mean just pregnant, I mean almost-ready-to-drop pregnant. This raises the stakes in some interesting ways. Verity has scaled back her activities as an investigator for the Council, but events conspire to draw her in. She’s forced to weigh her duty to the Weyrd community against her daughter’s safety. The theme of motherhood plays out in several strands of the book. In particular, it is concerned with neglectful mothers and examines where this can be fairly benign all the way through to where it facilitates abuse. Readers should be warned the story is quite dark in places, involving off-screen family abuse and on-screen suicide. The book is not without humour, however. Fassbinder’s Law of Handbags made me chuckle, and I cackled out loud at numerous points of the story. I also appreciate a book that takes its cake seriously… though marshmallow and caramel sounds a bit sweet for me. One of my criticisms of Vigil was its depiction of Verity’s love interest, David. I was pleased to see him get a little more screen time in Corpselight. He’s still a relatively shallow character–but this is by design. It reverses the gender dynamics often present in male-led urban fantasy and noir. David is the supportive spouse, there to love and enable Verity. While this was also true of Vigil, his added screen time gives weight to the affection he and Verity share. The story kept me on my toes. Every time I thought I’d figured out the direction it was going, it proved me wrong. The ending, in particular, shook things up and I’ll be interested to see how events play out in the sequel. 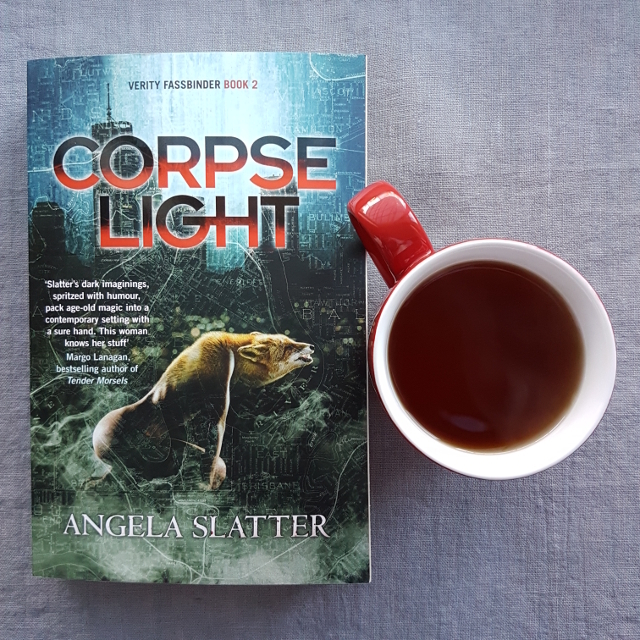 Overall, I found Corpselight to be a thoughtful example of urban fantasy and an excellent continuation of the series.